Summer, sisterhood and sacred answers in paradise. You're invited to find your mojo at THE LAST RESORT. Mojo and fitness guru, Rachel Woods, takes the women through adventures on the magic island to discover their deepest desires and fears. Readers will catch up with characters from Lott's previous novels: Ramona (Dating da Vinci), Taylor (The Stork Reality), Macy (Fixer Upper), Georgia (Life's a Beach) and get introduced to Kelly, who gets her own novel, Something New, in Fall 2012. The ebook novells is the perfect length to take on a summer trip or afternoon by the pool. First let me start this review off by saying that if you are already a fan of Malena Lott's or you usually enjoy Adult Contemporary's then you will more than likely like this novella. 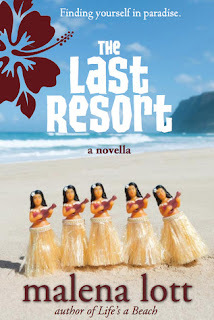 The Last Resort isn't my normal genre to be reading, and I haven't read any of Malena's novels before so it was a big change. I didn't necessarily find anything wrong with the story itself or the characters overall, but it just wasn't for me. I couldn't relate to the characters at all. I kinda felt like I was a little kid again and was listening in on a bunch of older ladies talking and gossiping. The issues that these women have just aren't things that I have gone through or can really relate to. All of the women in The Last Resort are in their thirties, the issues that they have are mother-hood, break-up, work stress, wanting to have a baby, deciding if its right to move on with your life, etc., I just haven't been through the same things these women have so I couldn't connect with them on a deep level. Now, Malena's characters from her previous novels are in this novella, plus a new character who will get her own book later, but it is a standalone. You do not need to read her previous novels to pick up this one, but I am sure it would help if you have, because then it would be easier for you to connect with these characters since you have already. I highly suggest that if it isn't usually your normal genre to read at least one of books that are incorporated into this novella before reading it, because then you have more pages and more details to try and make a connection with one of the characters and would probably enjoy this novella even more. I know that I have been mostly talking about what I didn't like about this novella, but there was definitely nothing wrong with it. It just wasn't the book for me. However, I did feel some real emotion while reading it. Some of the things these women are going through is heartbreaking and it is easy to feel their pain. I laughed and cried during this and it is only a novella! And it is a pretty great read for the summer. The Last Resort just wasn't my cup of tea. It honestly just isn't the genre for me. Adult novels are usually not my thing, but I just thought since it was a novella that it might still work for me. It wasn't bad at all, it just wasn't fantastic. I honestly just couldn't connect with the main characters, mostly because of age difference, and because I haven't gone through the same struggles they have. Overall, though, it is a very nice story. I definitely emotion while reading it and it is only a novella (lol) I definitely suggest this if you have read Malena's previous books or are a fan of Adult contemporaries, especially since if you end up liking the main characters you can always go and read their full books. good review, i am not a huge contemporary fan but this sounds like an interestimng read.